Aspiring Chicago rapper Ricardo “Nation” Burgos yesterday was sentenced to more than fifteen years in federal prison for illegally possessing a handgun while filming a music video. It’s too bad Cook County’s judges and prosecutors refuse to show that kind of commitment to reducing gun violence. 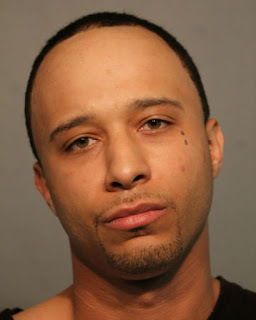 Prosecutors said Burgos, 31, was seen in a music video holding two firearms while rapping in a hotel room. Burgos had previous felony convictions and was not legally allowed to possess a firearm, according to a press release. Burgos pleaded guilty to a single federal count of illegal possession of a firearm and one count of distribution of a controlled substance in exchange for the 188-month (15 years, 8 months) sentence. One of the firearms Burgos was seen holding had been reported stolen and had been used in a shooting in Chicago two days before the video was made, the U.S. Attorney’s office said. The narcotics charge stemmed from allegations that Burgos sold heroin and crack to undercover cops in 2015. Federal inmates are required to serve a minimum of 85% of their sentences. In Illinois, inmates who don’t act up in prison are paroled after serving 50% of their time. Editors note: An earlier post of this story erroneously included a photo of a man other than Burgos. The previous photo, used with permission of an established news outlet, has been removed and replaced with a CPD mugshot of Burgos. CWBChicago regrets the error.